On 30 June 2018 in Yemen, a ship berths in Hudaydah port and emergency humanitarian supplies sent by UNICEF are offloaded. 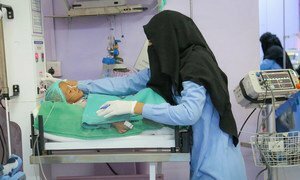 The United Nations should “actively and urgently” pursue negotiations for a leading role in aiding the humanitarian crisis in Yemen’s port city of Hudaydah, the top UN envoy for the war-torn country urged Friday. “The attention of the world is on Hudaydah,” the UN Special Envoy for Yemen, Martin Griffiths said in a statement during his visit to the city, which hosts the major port of entry for most of the county’s food and humanitarian aid. “I am here to tell you today that we have agreed that the UN should now pursue actively and urgently detailed negotiations for a leading UN role in the port and more broadly,” he said, adding that such a role “will preserve the essential humanitarian pipeline” that serves the country. “This is an essential step if we are to protect the lives of civilians and build confidence among the parties,” Mr. Griffiths said. “As you know I plan and hope to bring the parties together in Sweden very soon for political consultations,” he said, referring to possible initiation of peace talks between Houthi rebels and the Government.